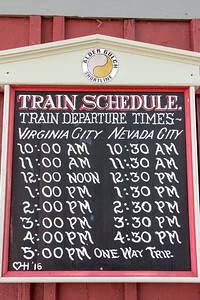 The Alder Gulch Shortline Railroad ferries passengers the one and a half miles between Virginia City and Nevada City. 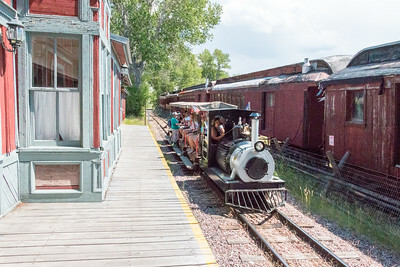 Conductors share tales of mining history and road agents on the 20 minute trip. 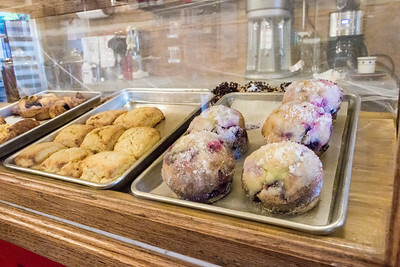 Guests of the Nevada City Hotel and cabins can grab a cup of coffee or espresso, browse through books on the area or just hang out in the hotel's "saloon." 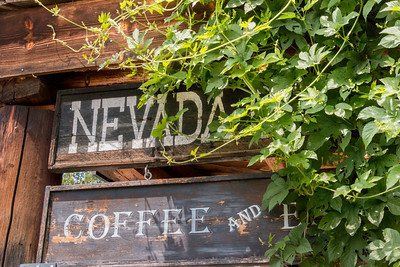 The Nevada City Hotel offers lodging on the site where the original hotel once stood. 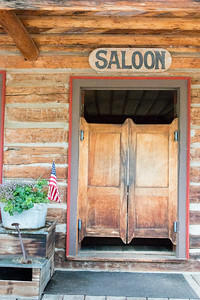 The repurposed log structure was built in the 1860s as a stage office. It’s most talked-about feature? The two-story outhouse. 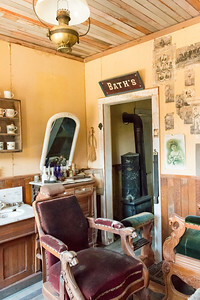 Originally from Elkhorn, a silver mining town south of Helena that boomed in the 1870s, the barber shop was part of Charles Bovey’s Old Town before being moved to the Nevada City Museum with most of its original furnishings intact. Panning for gold wasn’t the only way to make a profit in the mining towns. 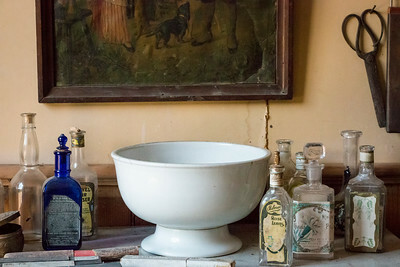 This basin and personal care products are among the artifacts in the 1870s barber shop from Elkhorn, a silver mining town south of Helena. 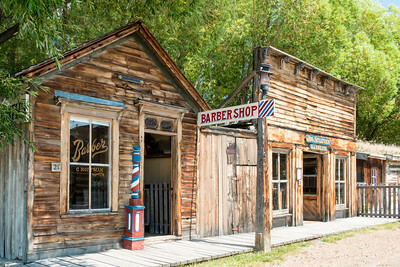 Homes and businesses dating from the 1860s to early 1900 line the streets of the Nevada City Museum. The Basin Fire Station houses a collection of vintage fire equipment. 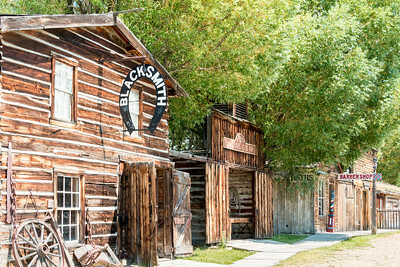 In the days of horse and carriages, every town had at least one blacksmith shop. This one belonged to Smoky Eberl, a blacksmith in Augusta, Montana. The E.S. Dupuis house, built in 1871, narrowly escaped becoming firewood, the fate of many Gold Rush era log homes. Already torn down, the home was rescued and reconstructed in 1976 by Charles Bovey, creator of the Nevada City Museum. 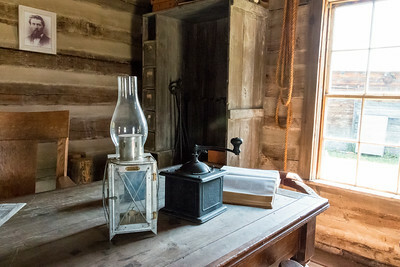 The house was later used to train families selected for the 2001 PBS TV series Frontier House. 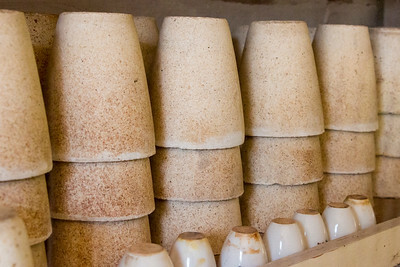 Crucibles that could withstand high heat were used in the assay, or evaluation of metal purity, of ore samples. Mine owners relied on assays to determine if the ore was worth mining. 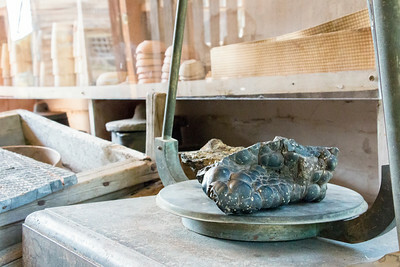 Mine owners relied on assays to determine if the ore was worth mining. 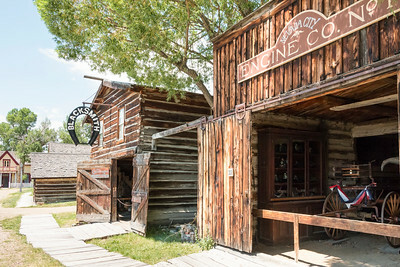 General merchandise stores flourished in mining boomtowns. 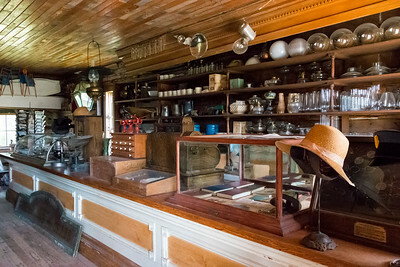 Furnished with goods dating to c. 1914, the Applebound and Crabb store was used in the movie “Little Big Man.” Dustin Hoffman played Jack Crabb. Only 12 buildings remaining on the Nevada City townsite — more if you count the outhouses. 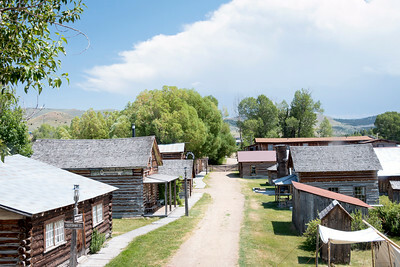 Charlie Bovey relocated historic buildings from Montana and Wyoming to the townsite, arranging them on grassy streets to create a frontier town, today known as the Nevada City Museum. Philanthropist and history buff Charlie Bovey filled the historic buildings he collected with artifacts from the 1860s through the 1900s. 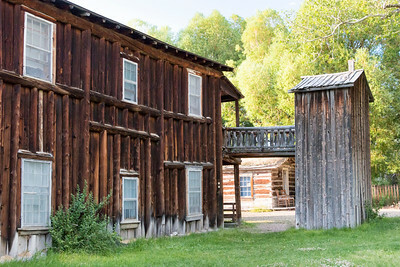 Today the Nevada City Museum features one of the largest collections of Old West artifacts outside the Smithsonian Institute. 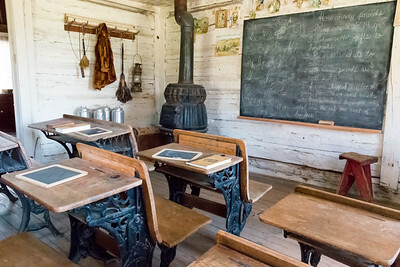 The Twin Bridges school is thought to be Montana’s oldest standing public school, serving students from 1867 until 1873. Students shared in chores, including cleaning and fetching water and firewood. 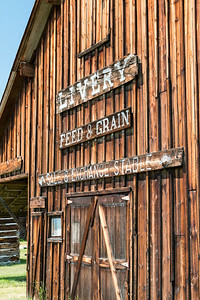 Built circa 1895 for the Meagher County Sheriff’s Department, the barn was the site of a triple hanging by the State of Montana in 1917. 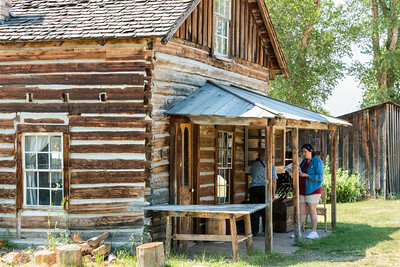 The barn has been a popular backdrop for several movies, including “Missouri Breaks” in 1975. When a federal postal inspector visited the Iron Rod Post Office in 1873, he found the mail had been dumped on the floor. Patrons dug through the pile and took what they wanted. The postmaster was reportedly out hunting gold. 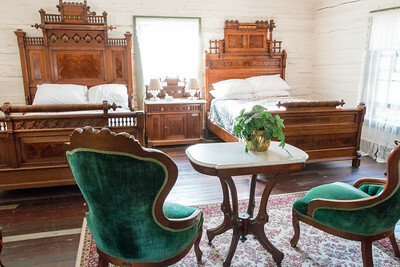 The Victorian suites in the Nevada City Hotel are in the oldest part of the hotel and offer easy access to the second-floor gallery. 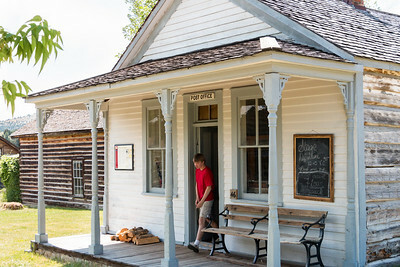 The repurposed log structure was built in the 1860s as a stage office. 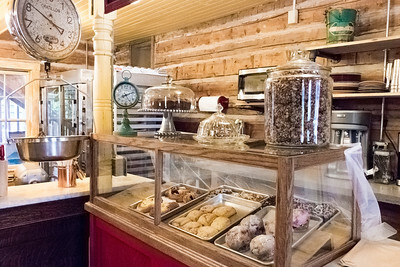 Additional hotel rooms and cabins are also available. 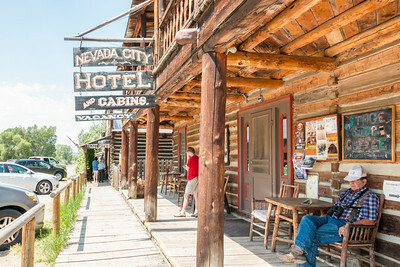 The back portion of the Nevada City Hotel was originally the employee’s dormitory at Hotel in Yellowstone National Park. 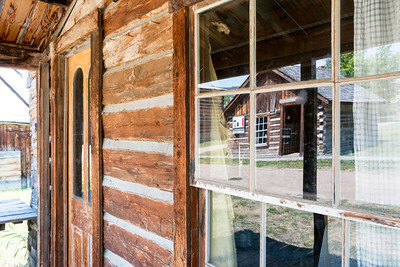 Two- and even three-story outhouses were common in the Gold Rush era. The outhouse here was originally attached to the Thexton family home in Virginia City.